Our auto mechanics love their automobiles, whether it’s driving 200 mph on a race track, cruising on Lake Shore Drive or Pacific Coast Highway, rediscovering the magic of Route 66 or driving down Main Street. There’s nothing like getting behind the wheel of our favorite car or truck. The key is keeping that special feeling over time. Unfortunately, consistent maintenance and occasional auto repairs are needed to keep them running at peak performance, and the best place to take your car or truck for all of its servicing needs is to one of the 14,000 members of the worldwide Bosch Service network. The Bosch Service network is a collection of the top independent repair centers, servicing gasoline, diesel and hybrid vehicles. Bosch Service centers receive quality parts, diagnostic and wheel service equipment and training from Bosch, the largest original-equipment parts manufacturer in the world. All Bosch Service centers must pass a rigorous evaluation to be accepted to the program, and are frequently inspected to make sure the high Bosch standards are being maintained. This ensures that you will receive reliable maintenance and repair, with exemplary customer service, whenever you visit a Bosch Service center. At Clarke Automotive, our goal is to keep your vehicle on the road for many years of driving enjoyment. 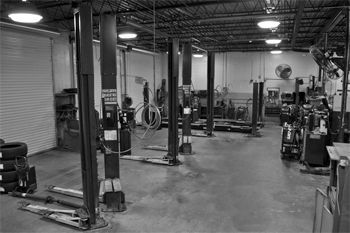 We specialize in auto repair, transmission repair, alignment, and much more – these are just a few things that make us one of the best local auto repair shops. Contact us to ask about the high standards of our Bosch certified repair shop or set up an appointment for an auto service.